Alongside our established designer labels we are always on the look out for new additions to make sure we keep offering you something different and unusual. 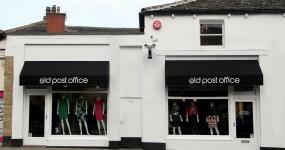 Welcome to The Old Post Office, Huddersfield, a fashion boutique catering for discerning women with a distinctive, confident style and an appreciation for quality fashion. Elegant collections from International Designers including Marc Cain, Marc Cain Sport, Sandwich, Frank Lyman, Riani, Starinbar, Joseph Ribkoff and Oui to name a few. From relaxed, smart casual outfits to something for a special event, we cater for a wide range of ages with selections to fit all tastes in Huddersfield Showrooms. Situated in the heart of Almondbury, reputedly the oldest village in Huddersfield, we are easy to find on the main High Street with a double shop front and plenty of on-road parking.